Haterbragging on social media: Jennifer Weiner teaches how to co-opt haters into your own brand. Mastering the art of the haterbrag. Jennifer Weiner at a PEN America event on April 6, 2015. 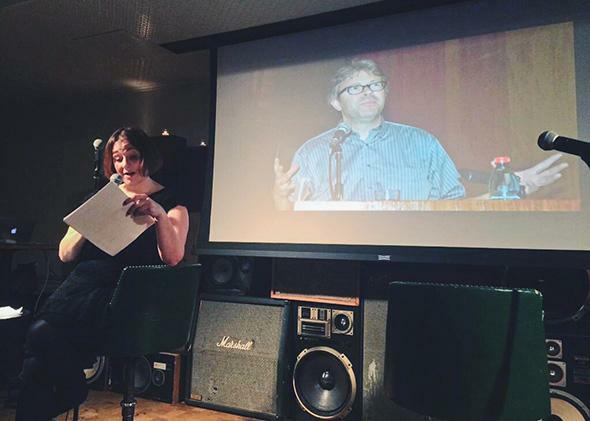 A slideshow projected on a screen behind her was loaded with pics of Jonathan Franzen striking stuffy promotional poses. Jennifer Weiner has sold millions of books, spent a combined five years on the New York Times best-seller list, and amassed 109,000 followers on Twitter. Last week, she descended into the basement of New York City’s Ace Hotel to share a handful of her self-promotional secrets. The talk, sponsored by the PEN American Center, was titled “How to Be Authentic on Social Media,” but its true subject was how to promote your book on the Internet without making everyone hate you. Weiner advised authors to tweet about the things they love (for Weiner, it’s the reality TV romance competition The Bachelor); to tweet about the authors they love (Roxane Gay and Gary Shteyngart are two of her favorites); and to tweet about their own projects “sparingly, carefully, modestly, thoughtfully, and absolutely as little as possible”—and let their now-loyal crew of social media followers spread the word. The talk was a handy primer, charmingly delivered. But it referred only obliquely to Weiner’s true social-media innovation: Co-opting her haters into her personal brand. Weiner is a master of what I’ve taken to calling the haterbrag. Think of it as the humblebrag’s evil (but funner) stepsister, a bit of social media sleight-of-hand that turns an insult into an asset. When Weiner cast the “Weiner-ish” line out to her followers, she jiu-jitsued his scorn, presenting herself not as the victim of a withering putdown by the great American novelist of our era, but as the accessible everywoman who stands in opposition to a stuffy highbrow jerk. She’s not the only one who’s learned to manipulate a foil for fun and profit. Heather Armstrong, who writes funny, no-holds-barred dispatches about her family life on her blog Dooce, has distilled a decade of rude comments into her short, sweet Twitter bio: “I exploit my children for millions and millions and dollars on my mommyblog.” Bloomberg Politics reporter Dave Weigel takes the most foolish comments aired about him on Twitter and retweets them to his own audience of 150,000. A popular Jimmy Kimmel Live segment invites celebrities to read mean tweets about themselves on the air; somehow, the exercise always manages to confirm the hater’s insignificance and accentuate the celebrity’s easygoing cool. Sarcastically nodding to one’s haters is “rarely about winning that particular conversation,” Silverman says. “It’s about looking witty or snide in a conflict that’s performed for a public audience.” When you retweet an insult from a hater, you shift the balance of the audience from the hater’s fans to your own; the person with the most followers ultimately decides the context in which the comment will lay to rest. Weiner has rejected characterizations of her interactions with Franzen as “feuding,” arguing that the term recasts a woman with a dissenting opinion as bitter and petty. But the term is incorrect in another way, because the antagonistic “relationship” between the two authors has been defined largely through Twitter, a universe in which Franzen has no agency. Though he has inspired several parody accounts, Franzen is not on Twitter, and I can’t exactly blame him. In his absence, Weiner and others have molded his persona into a buffoonish caricature. According to the view from the social media cheap seats, he’s just an out-of-touch, bird-watching white dude who thinks he’s better than Oprah—the perfect foil for Weiner’s power-tweeting, Bachelor-watching feminist brand. In some ways, the haterbrag phenomenon recalls the dynamics of the modern rap battle, which itself has begun to spill over from the studio and the stage onto Twitter. One of Kanye West’s lasting contributions to hip-hop is his recasting of the “hater” from an antagonist to an asset, Ben Gabriel argued in an essay in the New Inquiry in 2011. Instead of expending his energy fending off lesser rivals, Kanye recognizes that the “vocal ignorance” of his haters is a “natural resource” that can be converted into a conduit for spreading his own message. After Kanye sat for a searching conversation with BBC Radio in 2013, in which he discussed his difficulties breaking into the fashion world, Kimmel mocked him by hiring a small child to sip a milkshake and scream out choice Kanye quotes. The Kimmel sketch was ignorant, lazy, and not widely viewed until Kanye attacked it on Twitter; the rapper quickly leveraged the controversy into an extended sit-down on Kimmel’s show, which he used to promote his vision for apparel. Kimmel, the ostensible host of the show, could barely get a word in. Gabriel points out that Nicki Minaj’s 2009 track “Still I Rise,” which is written in the collective voice of her haters, chooses its haterbrags wisely in order to underscore “the important themes that underlie an emcee, but only negatively.” By giving voice to the haters who call her a lesbian Chinese Lil’ Kim impersonator, Minaj reinforces her image as a “post-geographical,” “post-heterosexual” rapper, one deserving a prominent placement in a particular “female pantheon,” Gabriel says. The art of the haterbrag lies in the curation: Dozens of pedestrian insults can pass through a person’s feed before a truly bizarre or ironic comment appears. When Butler University literary journal Booth prodded Franzen to elaborate on his feelings about Weiner in a February interview, he produced several perfectly mean quotes about her; she selected the most peevish of all of them—“She has no case. So she tweets”—and elevated it to her Twitter bio. Some haterbrags work because the comments are so negative that they end up circling all away around to complimentary, or even unexpectedly profound. In 2012, some guy read a personal essay I wrote and wrote in the comments, “You make even a potentially funny story make me want to shoot myself”; I know he was trying to be mean, but I can’t help but read it as a testament to my emotional range. Other haterbrags earn points for superior riffability. I once referred to Weiner as “an imperfect vessel for confronting sexism in the publishing industry”; she smartly capitalized on my icky word choice and added the phrase to her haterbrag repertoire. Recently, when a follower suggested that Weiner concoct a signature cocktail for her “unFranzen fest,” Weiner quipped that it ought to be served in an “imperfect vessel.” And the Twitter bio of National Journal reporter Emma Roller suggests an innovative twist on the form: “Someone called me pithy once, but maybe they just had a lisp.” The line positions Roller’s persona between a straightforward compliment and a sexist dig; it is at once self-promotional, self-deprecatory, and subtly haterbraggy—basically perfect.